The Church celebrates Epiphany, before Twelfth Night on January 6th. The importance of the Feast of Epiphany is probably the manifestation of the Christ Child to the Magi, who understood something of His significance, unlike Herod, who tried to kill the Baby Jesus. Then, too, there is the idea of gifts, which has become such a large part of Christmas today. 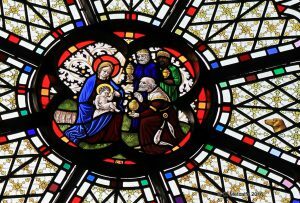 Many traditions, and several Christmas carols, have evolved about the visit of the Magi, and we are left with many questions- were they Wise Men, or Kings? Were they really called Caspar, Melchior and Balthasar, and what was the significance of their costly gifts of myrrh, frankincense and gold? At St Swit hun’s church, stained glass windows give us some interpretations of Epiphany to ponder. 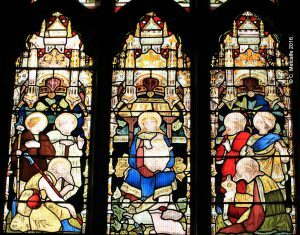 In the Memorial Chapel, to the right of the main altar, the window on the right depicts the 3 Magi bringing gifts to the Virgin and Child, in the top right hand panel. 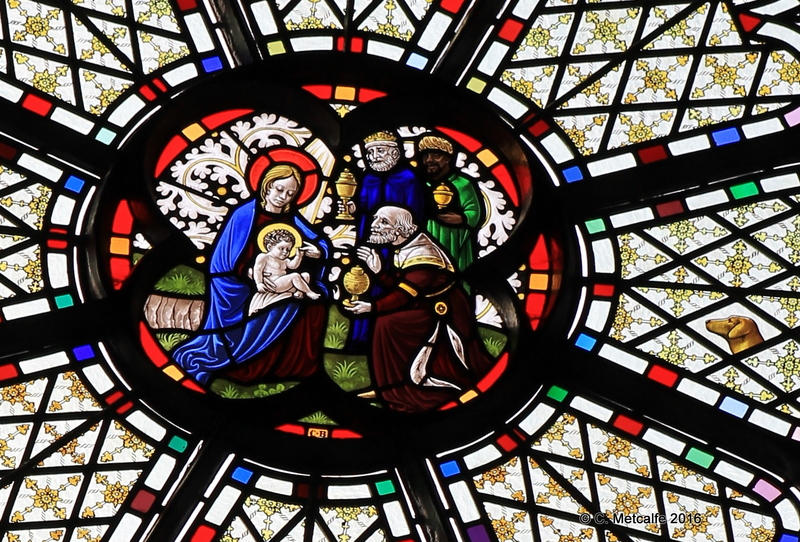 In the Chapel of the Nativity, to the left of the main altar, there is a beautiful picture of a chalice being offered to the Christ Child, who sits upon his Mother’s knee. This stained glass, with its striking blue background, is thought to have come from a mansion in Ballina, County Mayo. The mansion was apparently destroyed in either the eighteenth or nineteenth century, but the stained glass was eventually acquired for this Chapel. The Chapel was created when the new organ was moved up into the Gallery, in the 1930s. Look up to the Clerestory windows on the South side of the church (on the right as you face the altar). 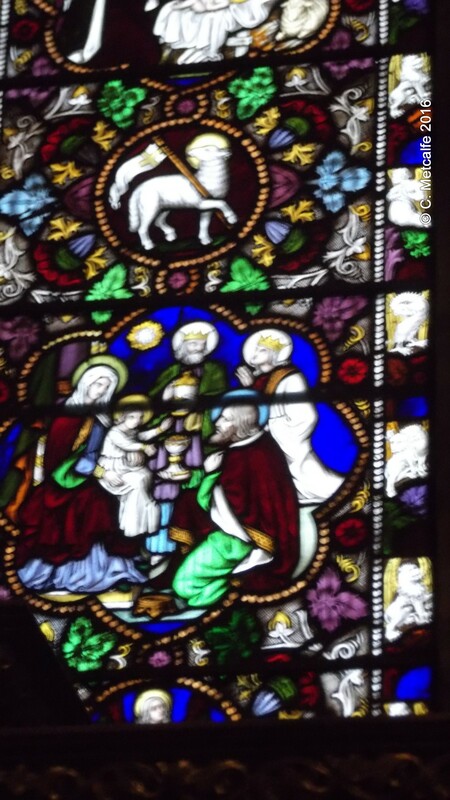 The 4th window down from the altar is called Epiphany and shows 3 Kings or Magi figures presenting gifts to the Baby Jesus and his Mother. 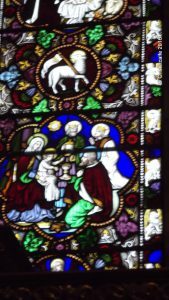 In the clear panes on the right hand side, there is the head of a dog, probably a pet belonging to the donor at the time when the window was given, in the 1980s.